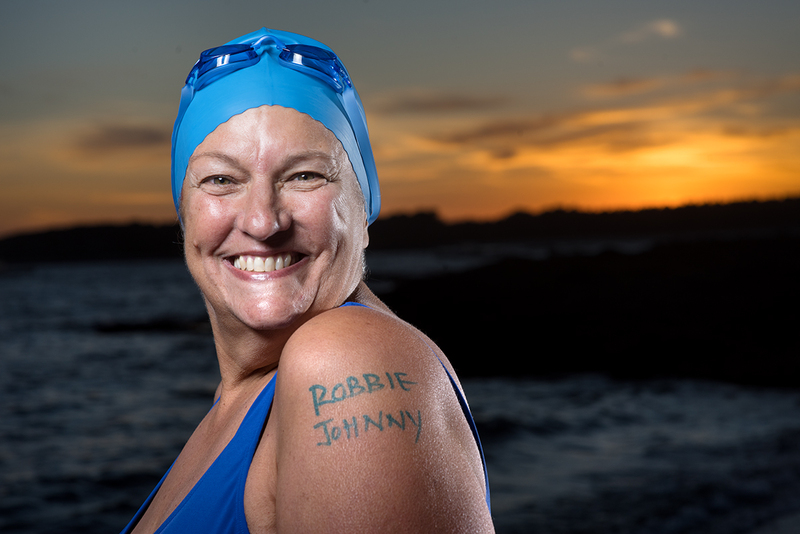 Pat Gallant-Charette wears the names of two of her now-deceased brothers on her arm for every swim. This week I published an Inspire Maine issue featuring Pat Gallant-Charette, a 65-year-old grandmother from Westbrook, ME. Some would say being a rockstar grandmother is inspiring enough—one that’s written her own children’s book, no less. But that’s not the inspiring part. 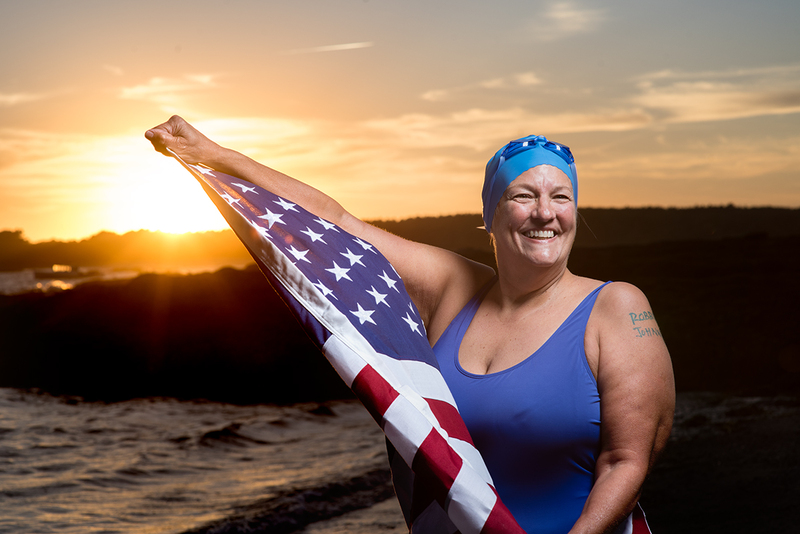 Gallant-Charette recently returned from the U.K., where she became the oldest person to successfully swim the North Channel. That’s the 21-mile stretch of freezing cold North Atlantic brine that separates Ireland from Scotland. At 65, Gallant-Charette was the oldest person to ever do the swim, by 13 years. And that isn’t even the amazing part. This is one of five swims she’s completed as part of the “Oceans Seven”(No, that’s not a buddy movie). It’s seven channels of water, from Japan to Hawaii to California…and the British Isles. To boot, Gallant-Charette finished the Strait of Gibraltar swim faster than any American woman since 1928. To her grandkids, she’s just grandma who travels a lot. But trust me, she’s amazing and a nice person, too. I photographed her at Kettle Cove in September and we had a great time despite the windy, chilly day. I loved the images but even more, I loved getting to meet with Pat. So do yourself a favor and check out her full interview over at Inspire Maine. You’ll be glad you did. 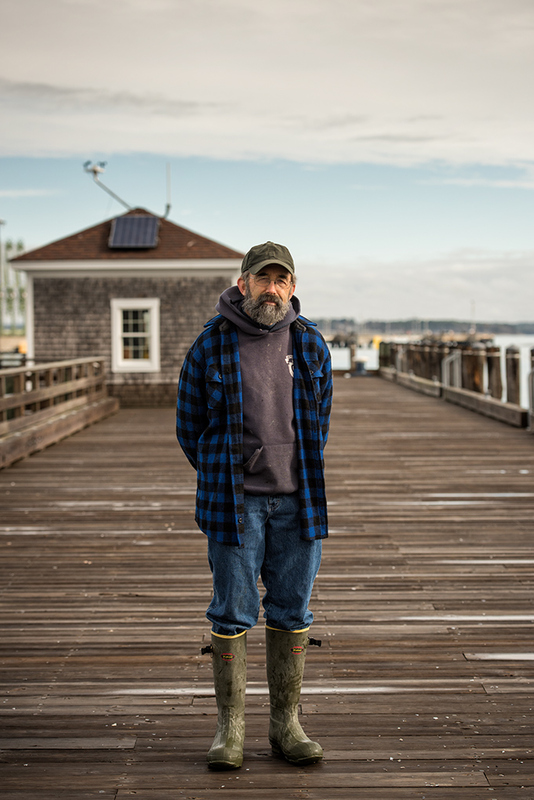 Pat Gallant-Charette, photographed at Kettle Cove in Maine. 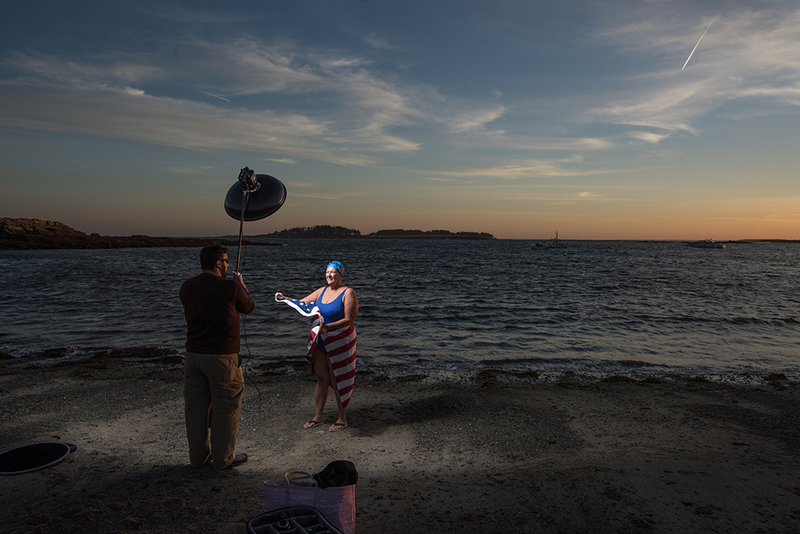 Being a Mainer helped her train for her marathon swimming success. “This is the best training ground outside of the North Channel and the English Channel,” she says. One of my favorite outtakes from the shoot, which I think looks best in black and white. 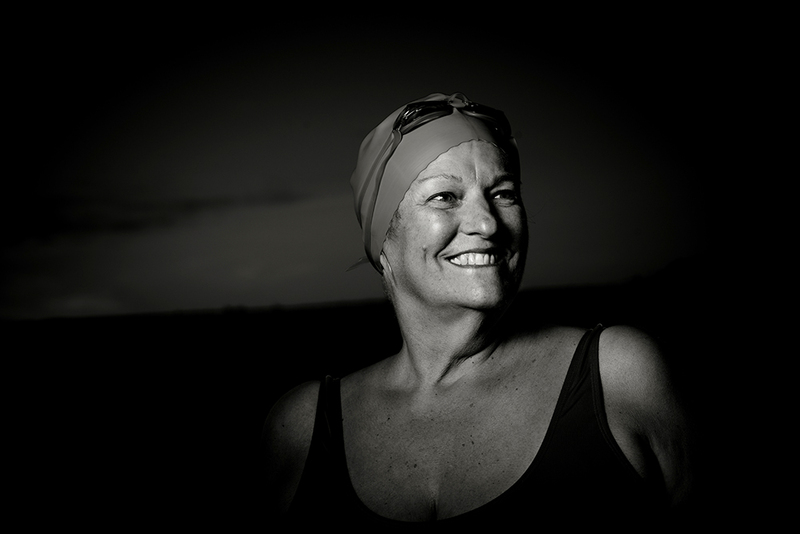 I can imagine Pat swimming alone in the dark and the cold, but fueled by her bright, optimistic nature. 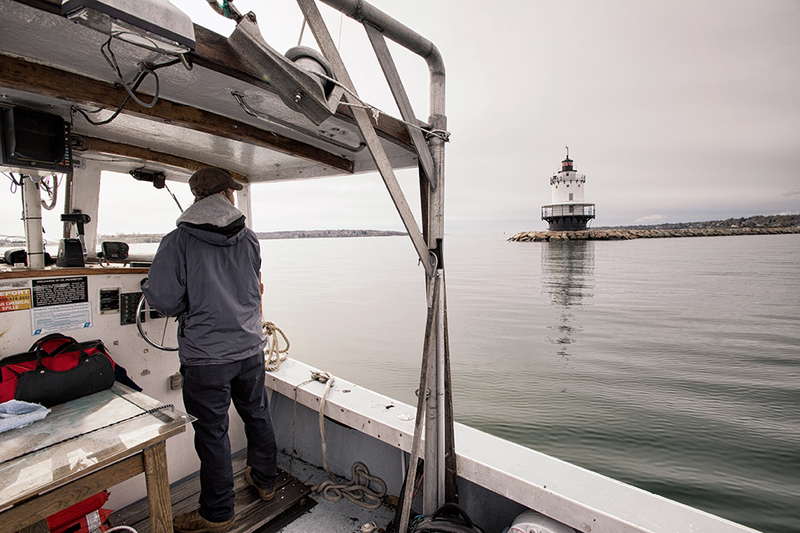 The wind—constant on the Maine Coast—was buffeting us on the water, which meant we had to keep lighting simple. Fortunately, simple often means “dramatic”. The thing I most love about Portland is definitely the diverse, interesting people that it attracts. Creatives, entrepreneurs, craftsmen, free spirits. 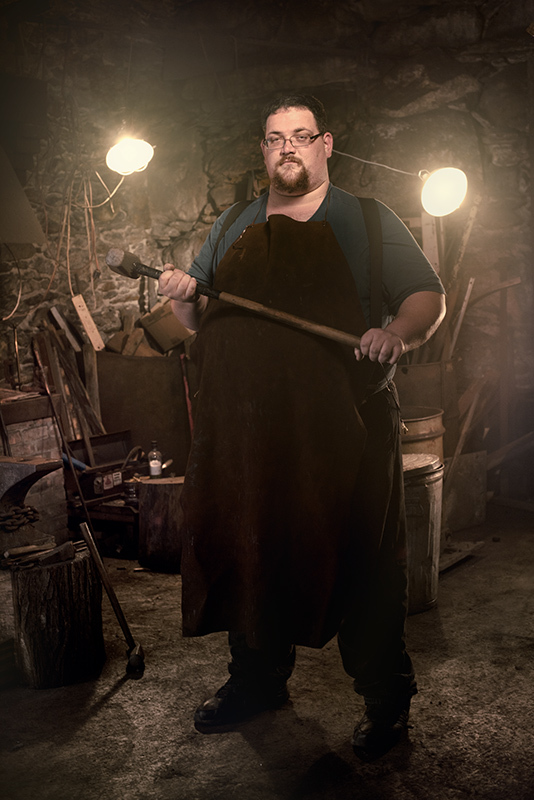 I recently photographed Sam Smith, a blacksmith who operates the Portland Forge out of the old Portland Company complex on Fore Street. All of the adjectives—creative, entrepreneur, craftsman, free spirit—apply. Sam has a well-deserved reputation as an artist and a craftsman. 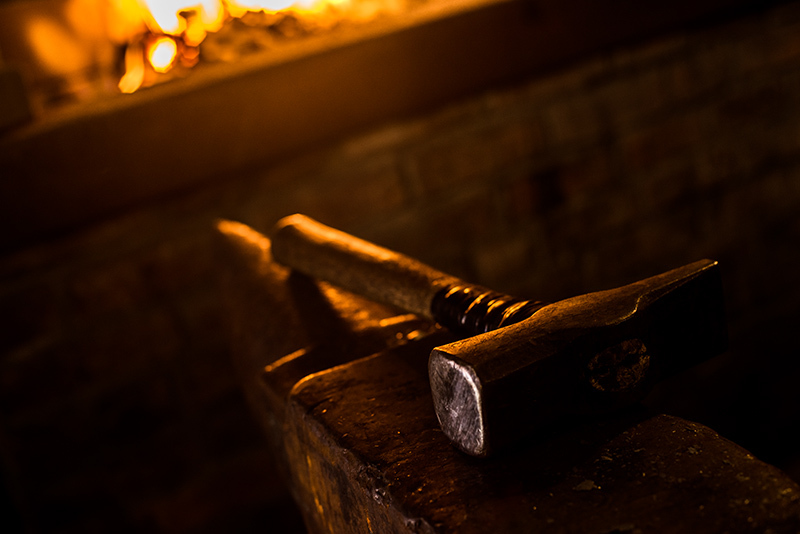 When he’s not operating a portable anvil out of his van somewhere in Maine, or teaching workshops in Europe, he’s hammering steel in the dark corner of a former train locomotive foundry that dates back more than 150 years. By the way, that space, and much of the complex itself, will soon be part of Portland’s past. The city’s master plan proposes a 10-acre complex of condominiums and retail shops to occupy the space that these red brick, charmingly dilapidated buildings now occupy. 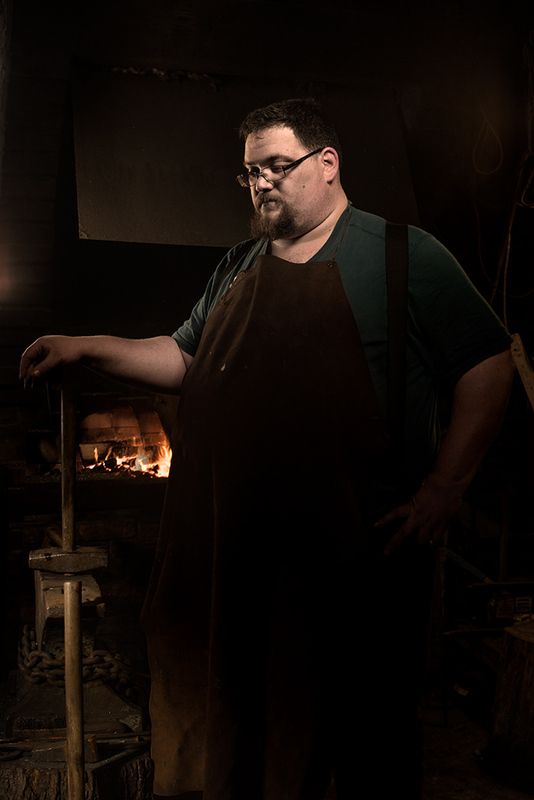 For now, Sam continues to work a forge that he created himself, in a small corner of Portland that—for now, thankfully—remains firmly rooted in the past. Thanks, Sam, for letting me and my camera into your world for a little while. Photographer’s Note: Mainers at Work is an ongoing portrait series featuring Maine individuals who work some of the most dangerous, dirty or low-paying jobs as compiled by CareerCast.Com for its 2011 ranking of 200 jobs nationwide. 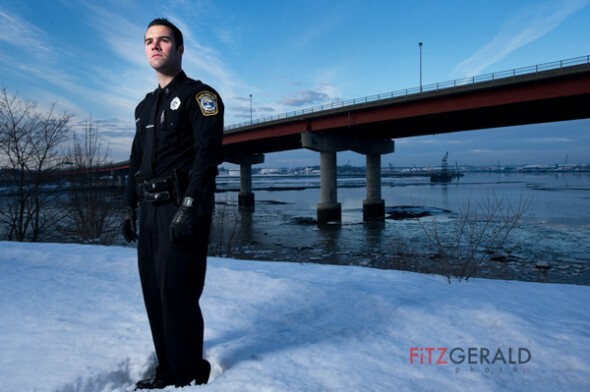 Behind South Portland police officer Rocco Navarro, the Casco Bay Bridge looms, a symbol that connects his past with a forever altered future. “You never think of this happening on a routine call,” he says. A former athlete with a degree in kinesiology, Navarro has to shift his hips to adjust for the weight of his duty belt, now painful to wear. 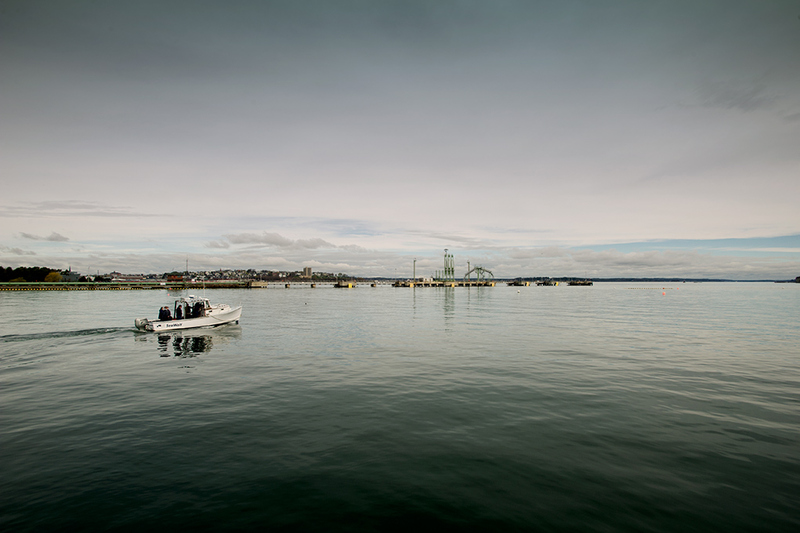 Stretching away across the Fore River and linking South Portland with Maine’s largest city is the drawbridge that more than 30,000 drivers cross daily. It was there, on Nov. 1, 2010, that Navarro had a brush with death—in the form of a distracted driver on a cell phone. 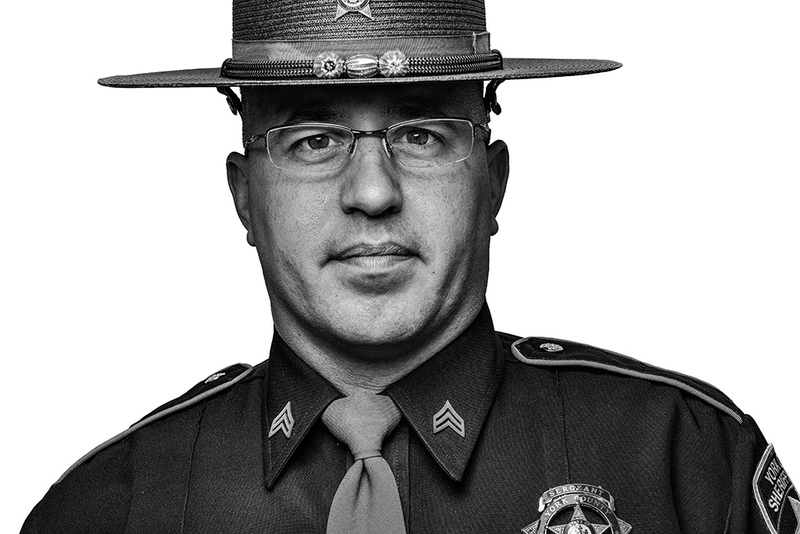 Navarro, 28, is in many ways a typical Maine police officer. 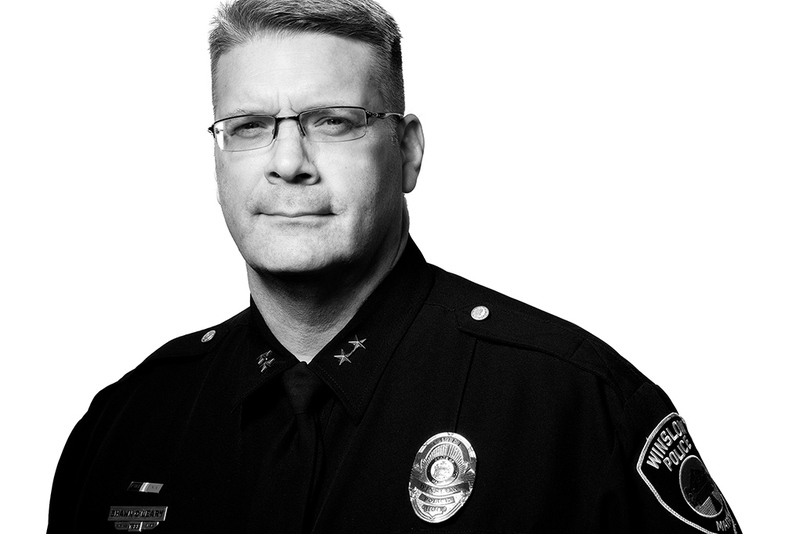 Born and raised in Portland, he attended local schools and played football—Navarro was a punter, and good enough to play for three years at the University of Maine—before deciding on a career in law enforcement. 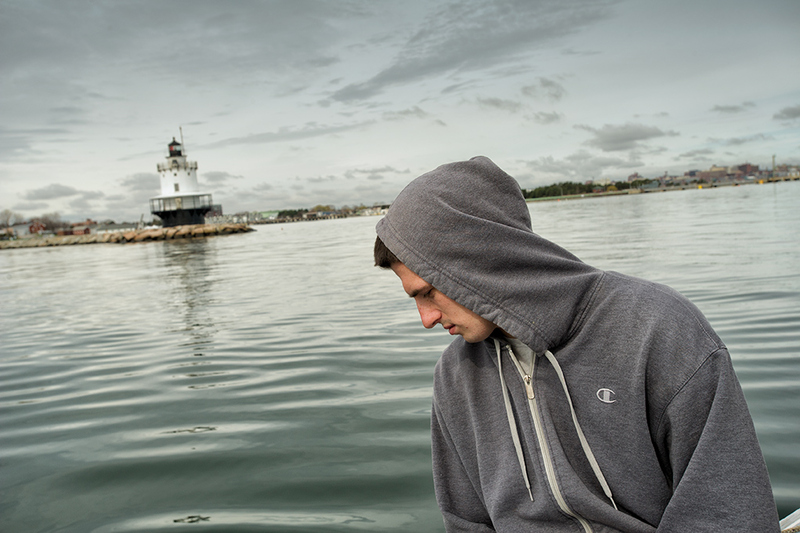 He chose South Portland because it was close to home but also because he wouldn’t be patrolling his old neighborhood. 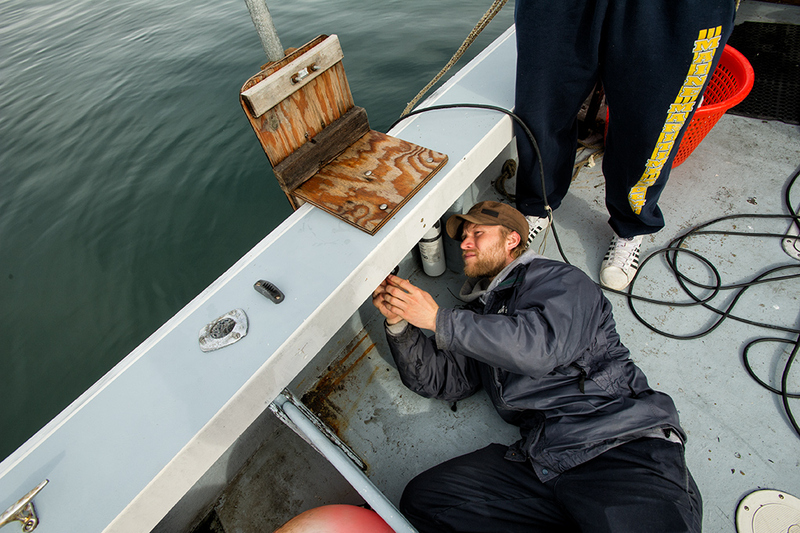 “I figured it would be too awkward to work where I knew everyone,” he says. After graduating the police academy in 2007, Navarro started on the late shift and eventually was assigned a daytime patrol slot, first shift, that started at 7 am. The morning of the accident, Navarro responded to a routine call involving a broken-down Kia sedan in the northbound lanes of the Casco Bay Bridge. It was just before 11 am, and Navarro had just returned to his vehicle, parked behind the disabled car, to await a tow truck. “Thirty seconds earlier, I would have been killed,” he says. 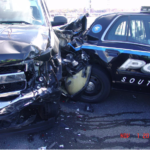 A full-size 2010 Chevrolet pickup truck rammed into the back of Navarro’s police cruiser at an estimated 45 miles per hour. 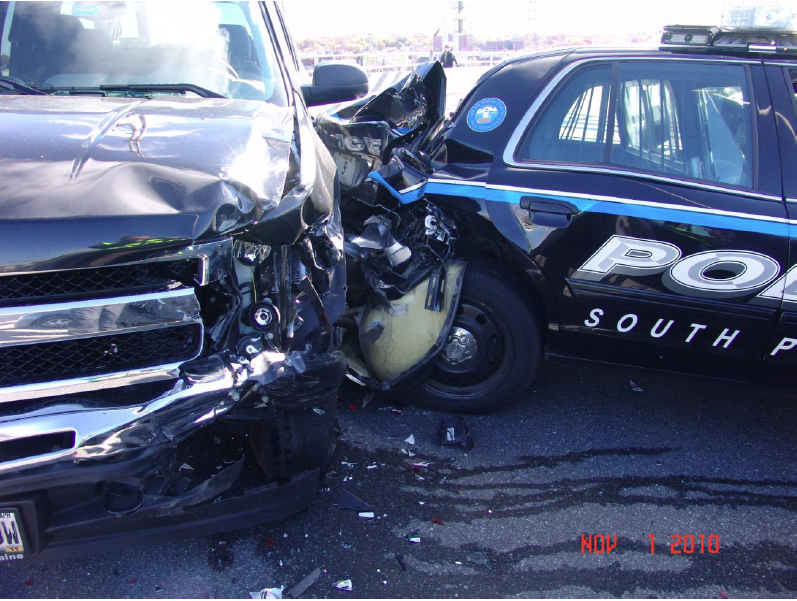 After the impact, the officer struggled to remain conscious. He manged to kick open his jammed driver side door and stand up briefly—he was concerned about the car catching fire, he says—and the last thing he remembers is fellow officer Robert Libby approaching the scene. The next thing he knew, he woke in the hospital. 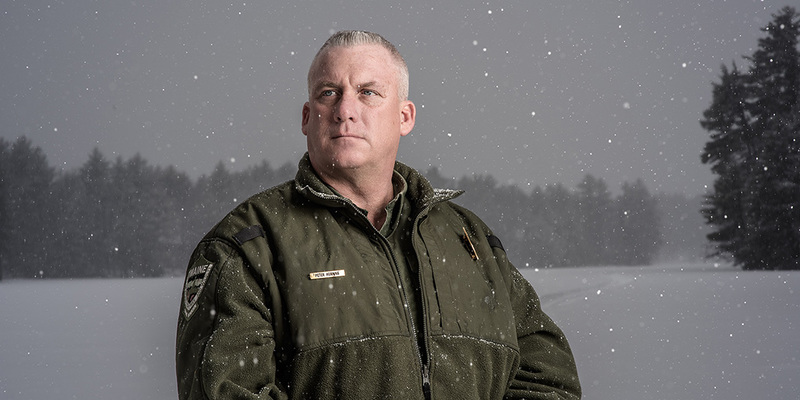 Maine is one of only a handful of states without laws banning texting and cell-phone use for all drivers–something Navarro and his fellow officers would like to see changed. The driver of the Chevy was cited for failure to maintain control of a vehicle. In the meantime, Navarro rides a desk until cleared for patrol duty by his doctors. That could still be a while. He’s also found he’s in a unique position to make a difference in the lives of others. 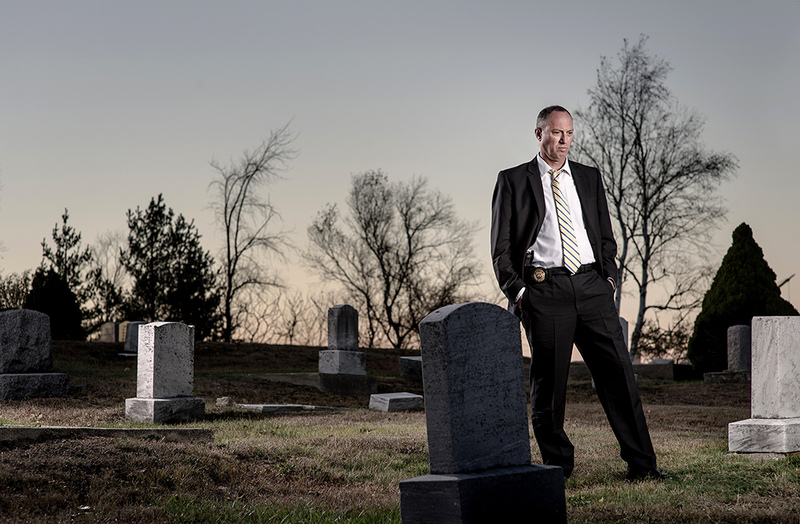 This month, he started speaking at local high schools on the dangers of texting while driving. He hopes to get back on the street and plans to eventually retire from the department despite the dangers.